If you want to have an easier time this Thanksgiving, you may want to consider making a no-bake dessert or two. In fact, no-bake desserts are great for any time when you want to make a low-effort dessert. 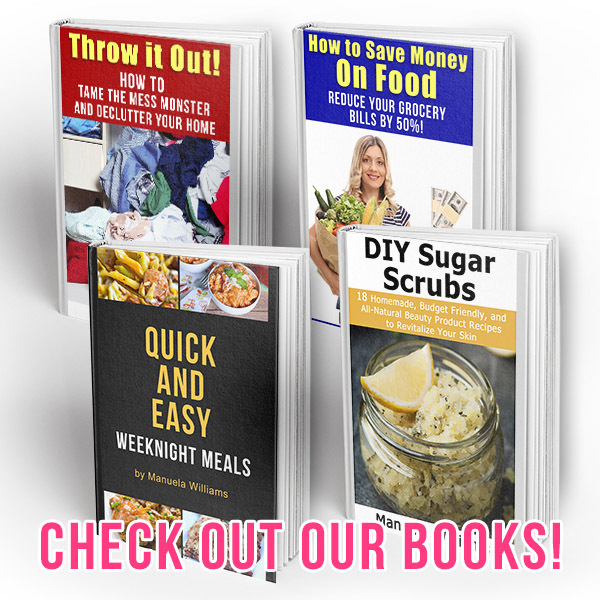 They’re quick to put together, and then you can go off and do other things while they chill! 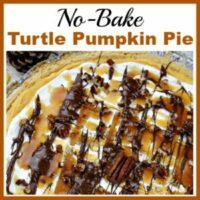 I’m definitely thinking of making at least one no-bake dessert for Thanksgiving this year, which is why I came up with this delicious No-Bake Turtle Pumpkin Pie! It’s so good, you can bet we’ll be having it a few times before Thanksgiving comes around! 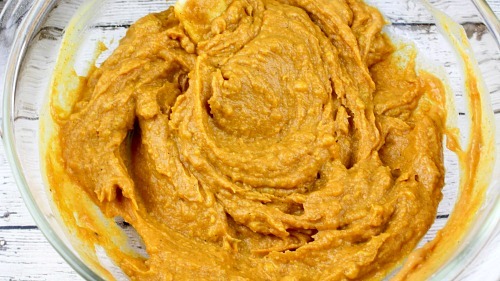 This is a great recipe to put together with the kids! My kids were great helpers sprinkling and spreading the different ingredients into the pie. The hardest part for them was waiting for it to chill! 1. Drizzle 1/3 cup caramel topping onto the bottom of the graham cracker crust. Using a rubber spatula, spread it out evenly. 2. Sprinkle 1/2 cup chopped pecans on top of the caramel. Set aside. 3. 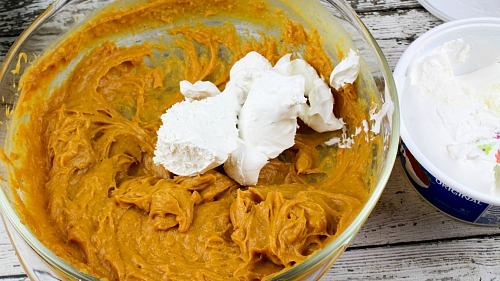 In a large mixing bowl, add the dry pudding, milk, pumpkin, cinnamon and nutmeg. With an electric hand mixer, beat until well incorporated. 4. 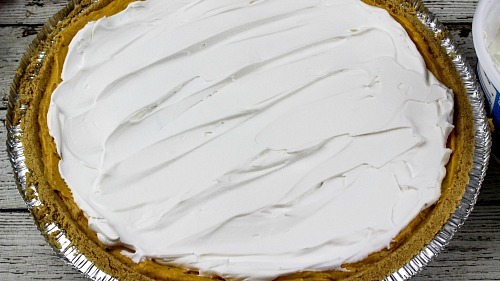 Fold in the thawed Cool Whip and pour into the pie crust. 6. Spread 1 cup of Cool Whip on top of the chilled pie. Even out with a spatula. 7. Sprinkle with chopped pecans. 8. In a microwave safe bowl, microwave the chocolate chips for 40 seconds. Remove from microwave and stir until melted and smooth. 9. 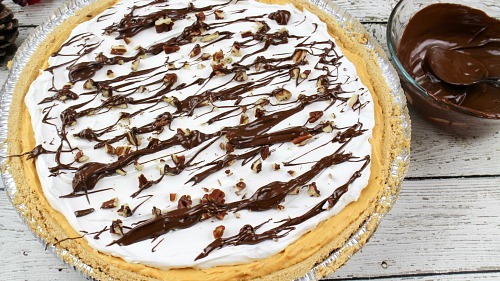 Drizzle the melted chocolate on top of the pie. 10. 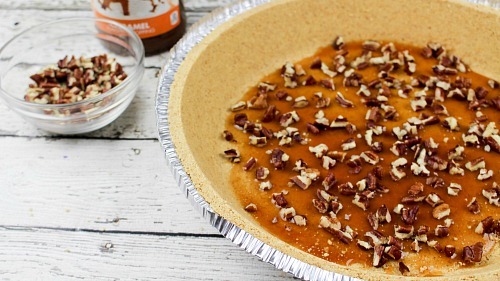 Drizzle the caramel topping all over the top of the pie. 11. Garnish with one or a couple whole pecan pieces in the middle of the pie. Keep refrigerated until ready to eat. 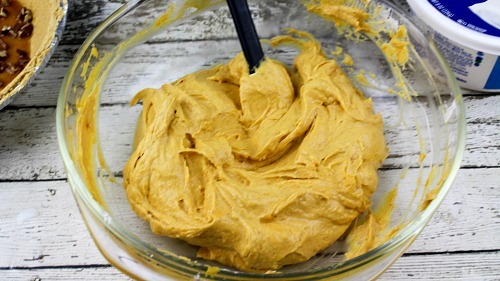 Then enjoy your no-bake turtle pumpkin pie! 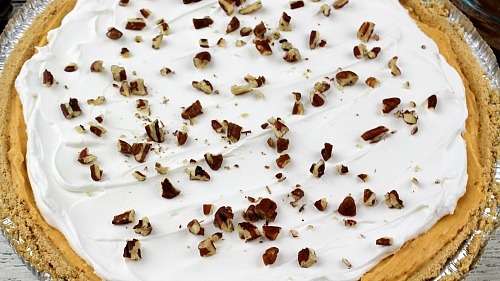 Will you be making a no-bake dessert this Thanksgiving? 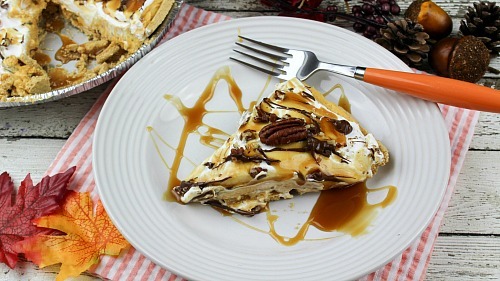 This no-bake turtle pumpkin pie is an easy and delicious fall dessert! Drizzle 1/3 cup caramel topping onto the bottom of the graham cracker crust. Using a rubber spatula, spread it out evenly. Sprinkle 1/2 cup chopped pecans on top of the caramel. Set aside. 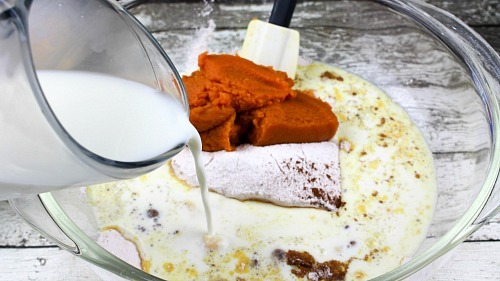 In a large mixing bowl, add the dry pudding, milk, pumpkin, cinnamon and nutmeg. With an electric hand mixer, beat until well incorporated. Fold in the thawed Cool Whip and pour into the pie crust. Spread 1 cup of Cool Whip on top of the chilled pie. Even out with a spatula. In a microwave safe bowl, microwave the chocolate chips for 40 seconds. Remove from microwave and stir until melted and smooth. Drizzle the melted chocolate on top of the pie. 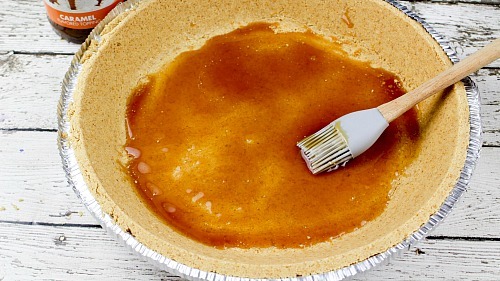 Drizzle the caramel topping all over the top of the pie. Garnish with one or a couple whole pecan pieces in the middle of the pie. yum! and it’s pretty, too! This sounds incredible! And I love that it’s no-bake. 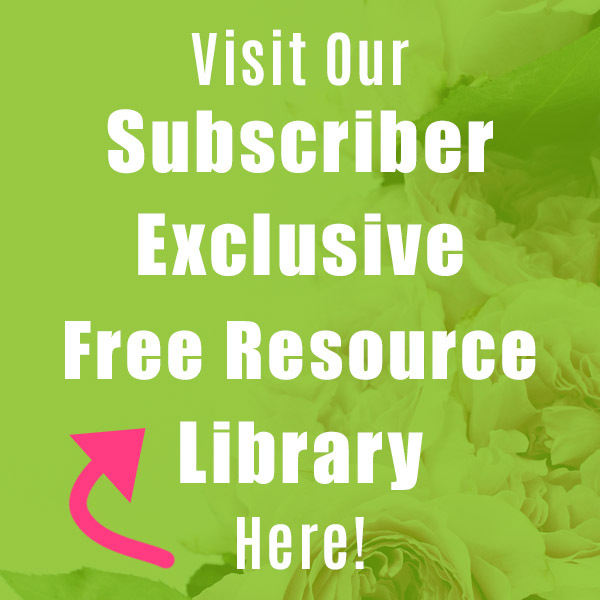 Thanks for linking up with Merry Monday! 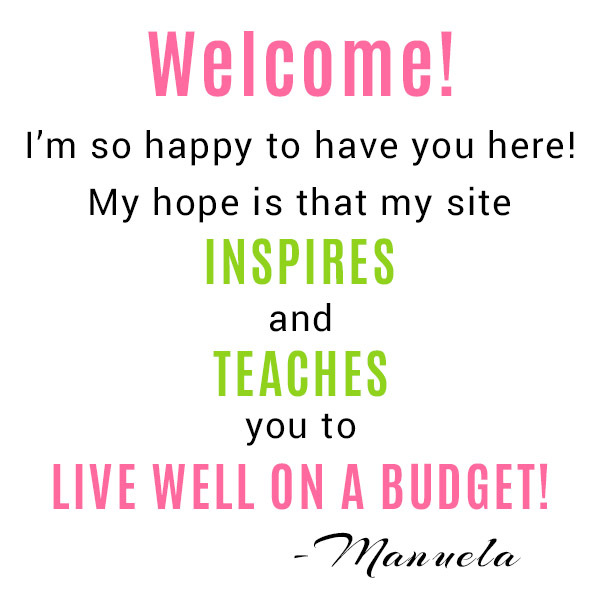 Hey, Manuela! 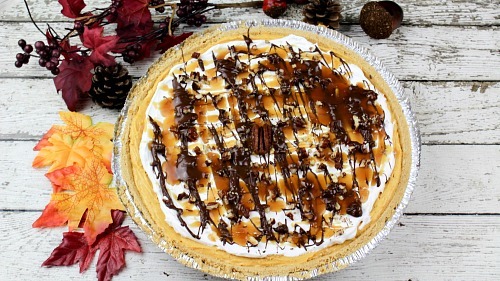 Just wanted to let you know that we loved your no bake turtle pumpkin pie so much when you shared it at the #HomeMattersParty last week, we’ve FEATURED it THIS WEEK! 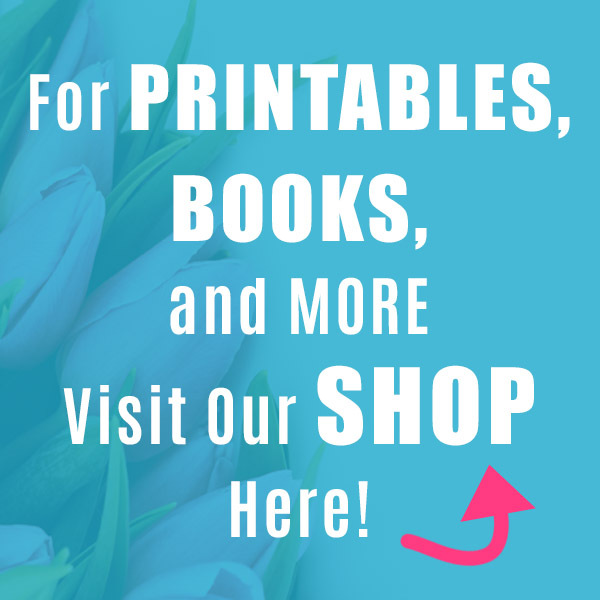 Hope you can check it out when you get a sec. Happy Friday!! !